This Christmas classic is made really luxurious with the addition of delicious kirsch-soaked cherries. Preheat the oven to 190°C, gas mark 5. Grease a 26cm x 35cm shallow Swiss roll tin or baking tray and line the base and sides with baking parchment. Place the eggs and sugar in a large bowl and beat with an electric whisk for 6-8 minutes until the mixture is pale, foamy and thick enough to leave a trail on the surface when the whisk beaters are lifted. Sieve the flour and cocoa over the whisked mixture. Fold in, using a large metal spoon, cutting through the mixture until all traces of flour are gone. Mix in 2 tablespoons of hot water, then the melted butter, until thoroughly combined. Pour the mixture into the tin, spreading evenly into the corners. Bake for about 15-20 minutes until the cake is firm to the touch. Remove from the oven and turn out, top-side down, onto a clean sheet of baking parchment. Then, after peeling off the used baking parchment from the base of the sponge, roll up the roulade, enclosing the clean paper. Leave to cool completely. Drain the cherries and set aside, reserving the kirsch. To make the ganache, pour the double cream into a heavy-based pan and heat gently until the cream is hot but not boiling, then add the chocolate. Remove from the heat and set aside for 2-3 minutes, stirring occasionally, until the chocolate has melted, then stir in 6 tablespoons of the reserved kirsch. Pour the ganache into a bowl and allow to cool, before chilling in the fridge for 1½-2 hours, stirring occasionally, until the mixture is cold and thickened. When the ganache is thick enough to hold its shape when stirred, whisk the whipping cream with 2 tablespoons of the reserved kirsch until it forms soft peaks. Unroll the roulade and spread the whipped cream to within 1cm of the edge. Scatter over the reserved cherries. Carefully roll up the roulade, lifting the paper with one hand and easing the sponge into a roll with the other hand. Slide onto a flat serving plate and discard the paper. Spread the ganache evenly over the roulade with a palette knife, using the blade to create a ‘bark' effect. Just before serving, decorate with bay leaves and fresh cranberries then dust lightly with icing sugar. 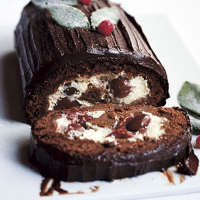 The roulade will keep in the fridge for up to 24 hours, but is best eaten on the day it is made. As an alcohol-free alternative use 300g stoneless black cherries in syrup (drained weight) and use the syrup in place of the kirsch.